Whatever your trading strategy, you have to have an edge or you will lose. Like competing for anything in life, if you don’t have an edge, don’t bother competing. For today’s piece, let’s look at a recent Live Trading Room trade as it represents a simple edge that offers consistent profitability. Below is a screenshot of our live futures trading room, the Extended Learning Track (XLT). During this session, there were 688 Online Trading Academy members watching our instructor set up a trade in the 30 Year Bond Futures. Notice the demand zone and the horizontal line just above it representing the prior day’s low. Next, notice the profit target above sitting just below the prior day’s high. Now, let’s go over and focus on our edge that made this trade work. To do this, we need to think like and understand the two groups at play in the market… Those who make profitable decisions and those who don’t. When you really understand how both groups make decisions, and can see those decisions on the screen by looking at a chart, you can win the game. We know that novice traders typically mark off the prior day’s high and low and buy and sell there. We also know that novice traders who do that typically lose money. 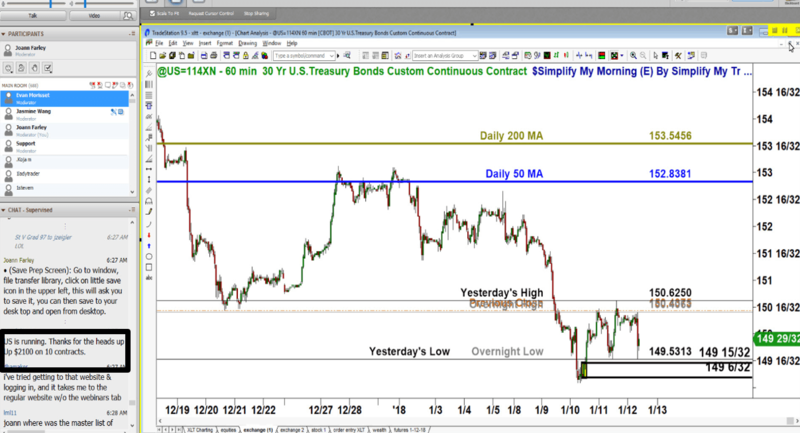 On the chart, we identified a demand zone sitting right below the prior day’s low. Our demand zones are where banks and financial institutions are buying. We also know that people who buy at the prior day’s low, for example, will likely place their protective sell stop just below that area. Having our buy orders at that demand zone meant that we would be buying at demand and at a price level where novice traders had their sell stops. In general, novice traders have their buy and sell stops at or around key market highs and lows which really helps the astute trader enter the market with low risk, high reward and high probability entries. The market then moved from demand to supply and back again as it should, that’s always how market prices move. One XLT member reported they made $2,100 in the chat box, where XLT members chat with instructors and each other. Buying sell stops and selling buy stops doesn’t just have to be a luxury big banks and market makers enjoy. Learn how to spot where they are in a market and you can attain those low risk entries also. Note – You have my email address below, please use it. I would love to hear your feedback on the articles and ideas for future articles. Don't Trade Bitcoin Until You've Read This! Was 2018 A Great Year for You? Where Will Price Turn, Where Will It Go To? Which Cryptocurrency Wallet to Choose?